I've been reading a lot of autumn themed blog posts over the last few weeks and it looks like everybody has special autumn traditions that include everything from that first Starbucks Pumpkin Spice Latte to the moment when you finally find the perfect Halloween costume. We got lucky this year with the costume and have already found a bright green dragon for our son complete with wings and a tail. I was going for orange but at least it's a dragon and it will make for adorable outdoor photos when we do our Halloween hike later this month. 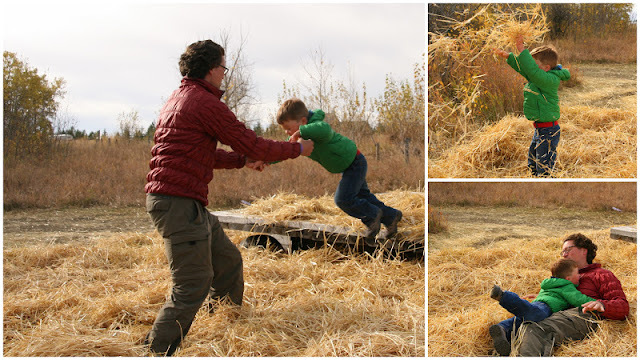 One thing on my annual to-do list is to get autumn photos of our family enjoying a day in the country. Nothing says autumn like a corn maze, pumpkin patch, tractor ride, and hay! Lots and lots of hay. I was a little worried about finding a pumpkin patch this year when snow fell early and sledding season suddenly came a month early. However, the snow melted and the sun returned for one last weekend so we could quickly make that escape out to a local farm. This was the first thing we saw when we got to Kayben Farms greeting us at the gate. We had a lot of fun on the Berry Bounce - a giant jumping pillow that is ingenious in its barrier-free design. Unlike a bouncy house, adults can jump too! No age restrictions - Whee!! I had fun playing Ring Around the Rosie with the kids. Playing with kids really does keep you young. The giant hay pile was a highlight of the day for sure! We jumped, we threw hay, we buried ourselves in hay. Even Daddy joined in the fun. This is my favourite photo I got of the day. Yay for the bright orange sweater. And yes, I chose it on purpose for the photos I wanted to take. Grandma was a VERY good sport playing in the hay with Noah! I don't know about your parents, but most older women aren't this keen to get straw down their jacket, in their hair, down their pants, etc. Noah also had a lot of fun playing in the hay with one of his best friends who joins us on most of our adventures. The pumpkin patch was pretty small but I manged to build up a little pile of pumpkins to get this shot that I absolutely love! My son isn't very crafty but here's a photo of his friend painting her pumpkin masterpiece. I think it's a very creative way to have a bit of fun with a pumpkin for the preschool child that can't quite carve a jack-o-lantern yet. And finally, what visit to a farm would be complete without a few friendly farm animals. We ended our visit to the farm with some more fun in the hay and a quick walk through the corn maze. We extended our day with a drive through the Sheep River area of Kananaskis since we were down in the area (and are never down that way). We stopped at a couple of small waterfalls not listed in most guide books (it helps to know the area for things like this) and took a short walk. We had planned to actually join the two waterfalls in a 2-3km loop hike but crossing the Sheep River half way along proved to be something that would get our feet wet and none of us had thought to wear sandals. Sadly, we had to turn back and drive to the second set of falls. But next time when water levels are low, we will make a loop out of it! Tiger Jaw Falls is a short walk right off Hwy 546 west of Turner Valley. Park at the Indian Oils Day Use Area and walk down the short fire road to the river. The next set of waterfalls further along Hwy 546 is Sheep River Falls. You'll find these falls at the Sheep Falls Day Use Area. What traditions make up your family's autumn memories? What a fun day! I'm so glad you were able to enjoy so many fun traditions. And I love the idea of tacking on some nature exploring to your day. Hi, I am seeing all over the place these mystery drinks "Pumpkin Spice Latte". Have no idea what they are!!! The traditions and experiences of North American autumn are unique.....we don't have anything like this for our changes of seasons. It all makes interesting reading. Cheers. Guess you'll have to come visit us some fall. Pumpkin spice lattes are amazing. It's just a late with nutmeg and other spices that we'd use to make a pumpkin pie. Topped with whip cream. Yummy!